This was a question I had one day and decided to look into it more. I thought at first that the first e-cigarette was invented in the 1950’s, I was surprised to find out that vaping devices go back as far as the 1920’s! V2Cigs has a great article about the real history of e-cigarettes where I got most of the info from. I wanted to condense the article and give you guys a vaping history class in less than a minute. 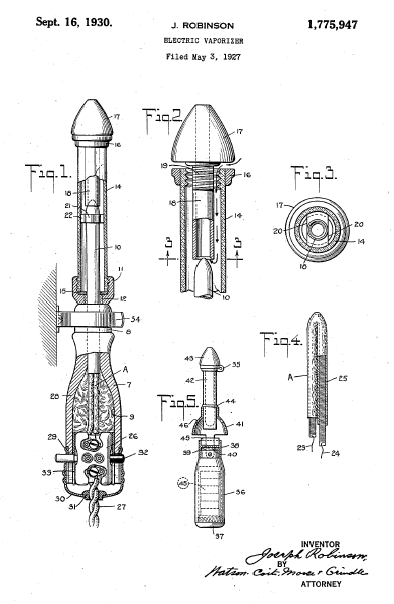 1927 – Joseph Robinson files patent in New York for electric vaporizer intended to heat medicinal compounds. 1963 – Herbert Gilbert files a patent for “a smokeless non-tobacco cigarette to provide a safe and harmless means for smoking by replacing burning tobacco with heated, moist, flavored air.” This happens in Pennsylvania, U.S.A.
2004 – Hon Lik of China files patent for the design of the modern e-cigarette. Very nice summary. I had no idea that vaping had that much history. Thanks! Previous Previous post: Should Vaping Be Taxed The Same Way Cigarettes Are?